Happy Wednesday dear friends!!! I can't believe that Memorial Day is around the corner! Whether you will be traveling on the first summer holiday of the year, or if you will be home doing yard work and cleaning your house, it's also a good time to build up your card stash for dear friends and loved ones. 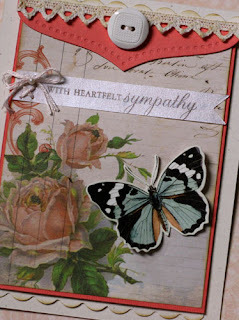 I used Glitz Designs Paper Layers to help me with this task! 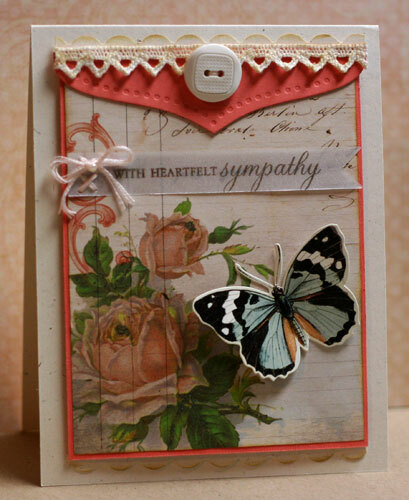 In my first card, the beautiful rose pattern in the Paper Layer inspired me to make a heartfelt sympathy card. I don't know about you, but sympathy cards are hard to make with all the emotion involved and it is nice to have a few on hand to give to those special friends whose hearts are grieved. I didn't want to take away from the beauty of the Paper Layer, so I stamped the sentiment on vellum and hand-stitched the vellum strip to the face of the card. Papertrey Ink: Melon Berry and Vintage Cream cardstock, Double Ended Banner and Banner Borders dies, Through the trees stamps; Vellum; DMC Floss; Fiskars Scallop Punch; Pink Paislee Butterfly Garden Ephemera. 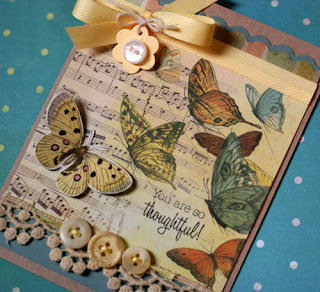 In my second card, the butterflies in the Laced with Grace Paper Layer inspired me to create a card that I know that I will need for a friend when I least expect it. Aren't the butterflies on this Paper Layer beautiful? Other Supplies: Papertrey Ink: Kraft and Hawaiian Shorescardstock, buttons, lemon tart ribbon, Tiny Tags Die, Flower Fusion #2 stamp set; Prima Lace; Pink Paislee Butterfly Garden Ephemera; DMC Floss; Fiskars Scallop Punch. 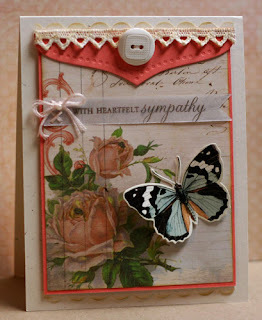 I hope this inspires you to make some cards for your stash. You never know when you will need a card for that special someone!! I wish you a very Glitzy Day!! !